The top UFC welterweight popped into the Crowd Goes Wild studios to talk his controversial fight with Georges St-Pierre at UFC 167, his new Reeboks, and much more. For being a corn-fed Oklahoman who harnesses the power of Thor’s hammer in his left hand, Johny Hendricks is about as humble and unassuming a guy as you can imagine. He’s like a Teddy Ruxpin bear come to life… if RKS ever released a dip-spitting model with fists of dynamite. Just take “Bigg Rigg’s” recent appearance on Crowd Goes Wild, for instance, in which the soft-spoken welterweight title contender dished on everything from his controversial loss to Georges St-Pierre at UFC 167 to his upcoming title fight with Robbie Lawler at UFC 171. And to top it all off, Hendricks handed out pairs of Reebok’s ZQuick sneakers, which hit the shelves on February 1, to everyone in the audience. What was he supposed to do? 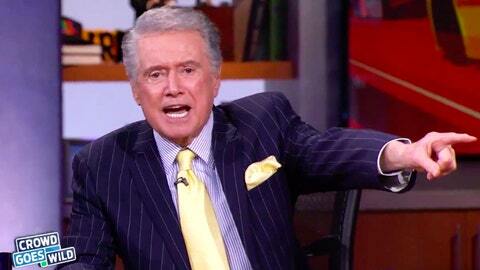 You snag an interview with Regis Philbin, you better be prepared to go big or go home. Check out the video of Hendricks’ appearance on Crowd Goes Wild above, then let us know how you think he’ll fare against Robbie Lawler at UFC 171 in March.